Yah it’s Friday!!! 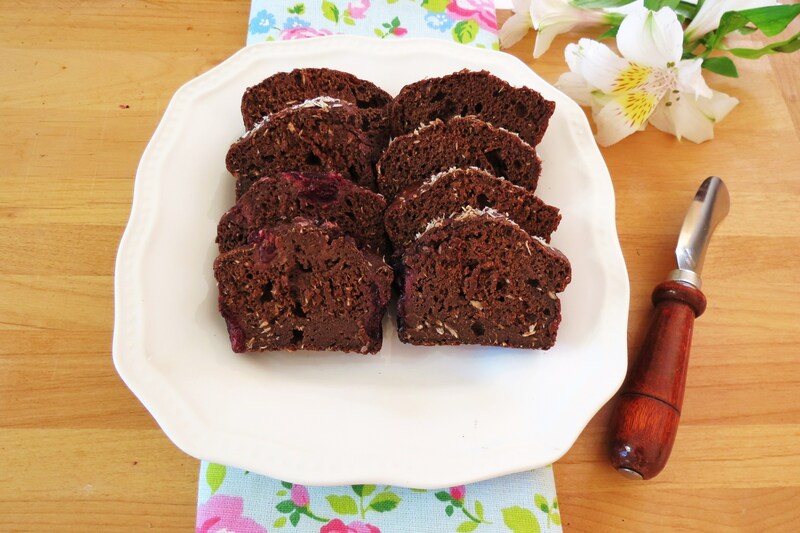 As a special treat I made the most delectable quick bread for you! 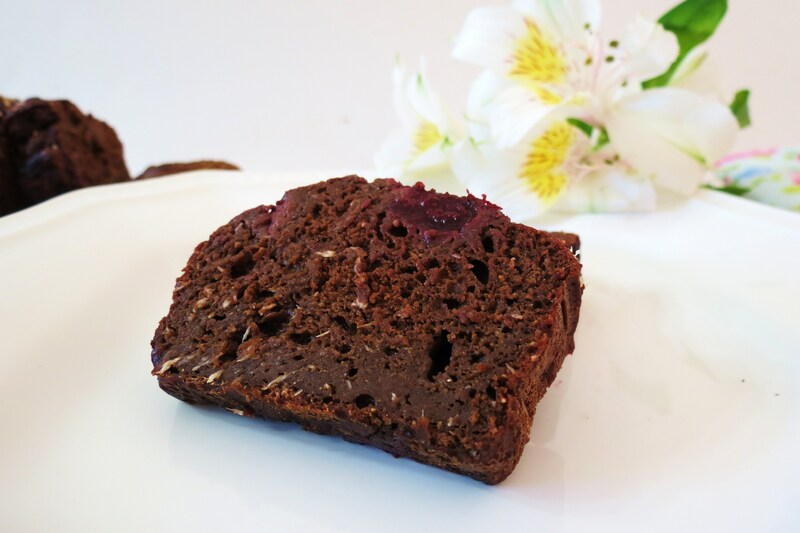 It’s rich, chocolaty, filled with fresh cherries and tastes like your biting into a brownie. It’s simply delish!!! I made my normal 3 mini loafs so Hubby can take them to work and I asked him what he thought about the bread and he said ohhh, that was good! Yah! Another success! Sometimes I’m bias of my own recipes, because I know of all the thought and care I put into it, that I think they are automatically tasty. Plus I cut back on sugar and now I don’t notice things when there not sweet enough for the average person. My Husband is one who likes it sweet! I felt this bread had the perfect balance of sweetness, especially with the cherries. I will tell you a secret, this past week, I made a Peanut Butter and Jelly Bread. I thought this is going to be the best thing ever. I had all these grand ideas of creating it and eating it. Well guess what? It turned out awful! Ugh! What a waste of jam and peanut butter! When it came out of the oven it tasted good, but a few hours later, it was just horrible. I didn’t realize how bad it was until my Husband took it to work and he said the bread was terrible. I felt sad, but I knew it tasted like crap! Funny how I’m sensitive to things like that, when I knew it didn’t taste good. Crazy! So are you getting sick of me posting cherry treats? Sorry, this is the last cherry recipe I have in my recipe index, but I figured since it’s cherry season, I felt the need to share it with you. However if you make this bread, you may not want to share it!! I have to show you how moist it is. 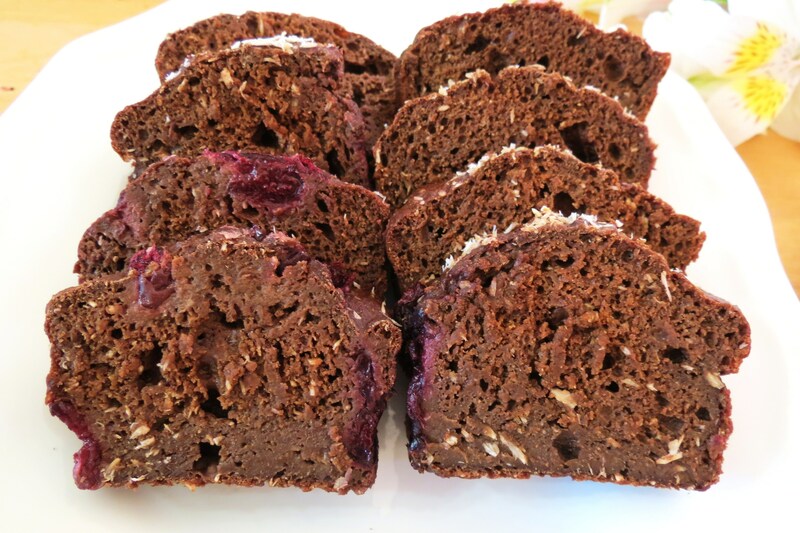 I made this bread using Chobani Greek Yogurt, unsweetened coconut milk and fresh cherries. This bread does not contain any oil or butter. I can’t believe how moist it is without oil! I bet you could heat this bread up in the microwave and top with some vanilla ice cream or whip cream and call it dessert! I should have done that! The calories came out pretty low, coming in at 86 calories a slice. I figured 15 slices to a large loaf or 5 slices per mini loaf. The slices are pretty thick! This bread also contains 1 gram of fat and only 16 carbs. I am pretty happy with the stats of the bread! Taking a bite of it tastes like I’m having a treat!! Since I made three mini loafs I froze two of the loaves and kept one out for nibbling on. I know I mentioned it before but freezing bread is one of the best things ever! Just take it out the night before or in the morning. It defrosts pretty quickly. 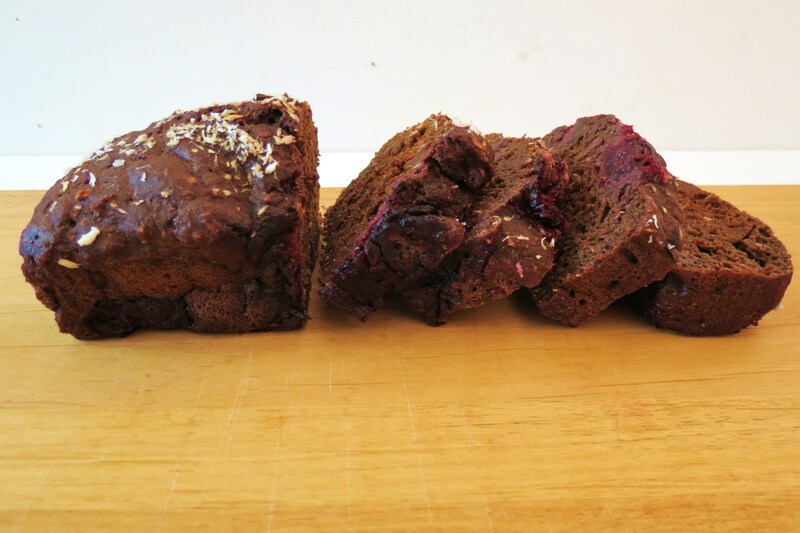 A sweet moist chocolate bread made with greek yogurt, fresh cherries and coconut. In a medium bowl, mix yogurt, coconut milk, sugar, eggs, vanilla and coconut extract until blended. In a separate bowl add flours, cocoa powder, baking powder, baking soda and salt. Mix together. Make a well in the center of the flour mixture and slowly incorporate the yogurt mixture, becareful not to over mix. Spoon batter into a greased 9- x 5-inch loaf pan or 3 mini loafs. I was bad and skipped out on exercise yesterday, so I need to do something today, even though it’s getting late, so I’m going to shuffle off. Oh and my Husband just made a pound of bacon and it smells so darn good that I need to get out of the house fast! So off for a brisk walk I go. I am not the best person to ask about gluten free flours, but my guess is that oat flour would work out great in this bread. Maybe even coconut flour. To make oat flour just take old fashion oatmeal and process in your food processor until it turns to a flour texture. Good luck and let me know how it turns out. It sounds lovely and I love all ingredients so I’m sure Its a winner! I finally found a cherry pitter after weeks of looking for one and our cherries dropped from $4.99 a lb to $1.99!a lb on sale this week so I’m going to stock up! The cherries are delicious and sweet I could eat a whole bag in 5 minutes!!! So I will be pitting and eating and freezing and marking some of your jam!! Wow thats a cheap price on cherries!!! I am with you, I could totally eat the whole bag in 5 minutes!! Glad you found your pitter, it is a cherry life saver!! If you do, stop back and let me know what you think of it! I love that this is low calorie! My husband would be so happy if I made this for him. Hey, put on all of the cherry recipes that you love. I stock up on them while they are in season. Yummy! I know cherry season is such a short season too! I need to stock up so I can freeze them. I could never ever get sick of your cherry posts! They are always so delicious…but really, especially this. 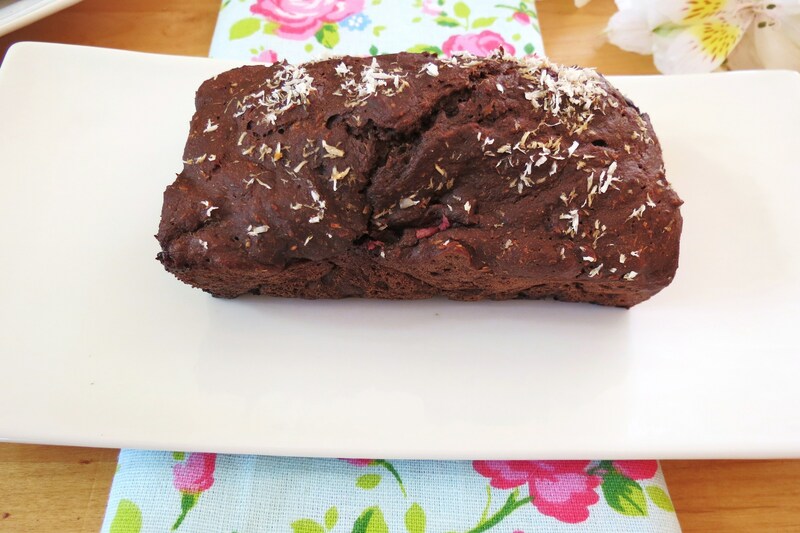 CHOCOLATE CHERRY COCONUT BREAD. That is LOW CALORIE. I’m in love. Ahh thanks Joanne! I am having so much fun cooking and baking with cherries! But the best way to eat them is plain! It’s nice that your hubby is honest with you. I really appreciate that because so many people will tell you something is good when it’s really not – so you KNOW when he says it’s good, it really is! Of course with cherries, chocolate and coconut, how could you go wrong? Sounds wonderful! Sometimes my Hubby is a little too honest for me. lol I kow I do not like to hear people say they didn’t like something I made, but I’d rather know that, then to keep serving it, thinking it’s good. I love how you use coconut milk and the fact that it’s healthy! It sounds incredible! Thanks Jessica. I love coconut milk, but for some reason I don’t care for coconut water. Strange huh? 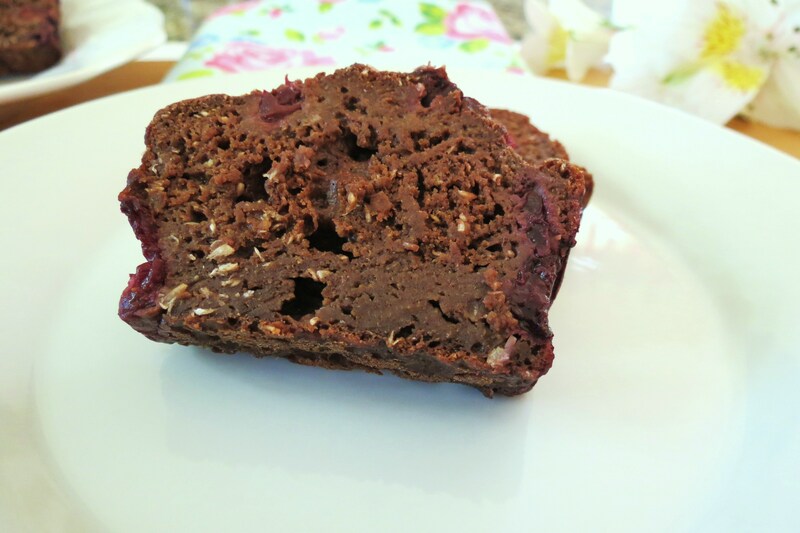 I love cherry and chocolate together, and this looks so moist and yummy! It’s funny how even if I know something doesn’t taste good I’m kinda hurt when my hubby tells me, and I start defending it anyway 🙂 Our recipes are kinda like our children sometimes!! I use the excuse to not eat all the bread is because I want my Husband to take something to work, otherwise I would eat the whole thing!! Yum! I made it tonight with a few altercations b/c of what I had! I used 2 flax eggs, 1 T coconut oil because I had no coconut extract and I thought it would be good! Also, I used the Silk carton coconut milk not canned (I wans’t sure which kind to use) and I used regular sugar. So good! Thanks!